This project involves GIS mapping and environmental review of MS4 Outfalls in NYSDOT Regions 8, 10 & 11. Shumaker Consulting Engineering & Land Surveying, P.C. (SCE) is responsible for all aspects of work in Region 8. 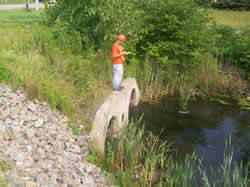 Project tasks include: locate system elements, record observational data, and map certain stormwater outfalls from State Highway drainage systems. The mapping and data will be collected using portable GPS-equipment and software specified by the NYSDOT Operations Division. The work includes reviewing any as-built plans/records available in the Regional office: field data collection using GPS equipment/software and transferring data to the Regional/Main Office server. Maintenance and Protection of Traffic (M&PT) may be required during the field mapping process, based on the MUTCD, NYSDOT Specifications, the duration of the site visit and varying highway conditions such as sight distance, traffic volume and the off-set from the travel lane of each location.